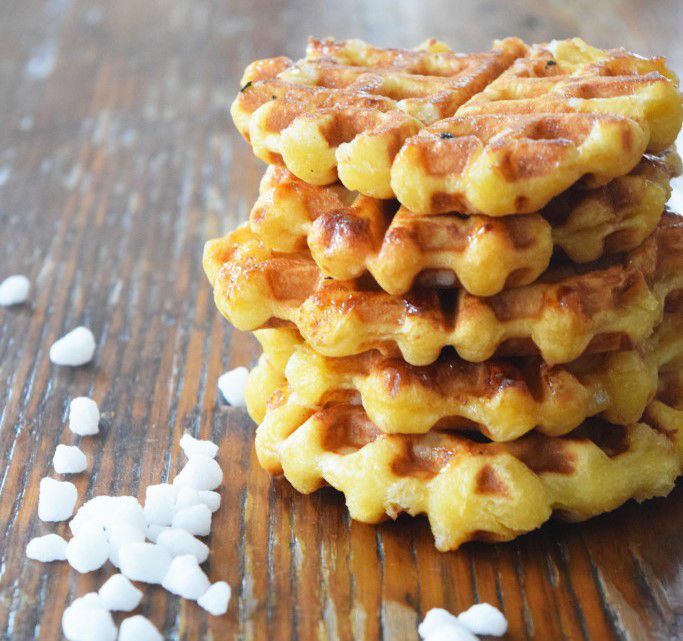 These are the real deal Belgian sugar waffles. In Belgium, they are called liege. They have a beautiful crunchy sugar coating and are soft and chewy on the inside. They smell of vanilla and taste like heaven! You can find them all over Europe and sometimes in the U.S. There is an amazing Waffle Cabin in Mt. Snow, Vermont that serves up these babies all winter long. You can even get chocolate drizzled on them. Luckily, you can easily make them at home with any waffle iron and only one specialty ingredient. And you can also slather some Nutella on them when no one is looking! You will need pearl sugar. You can order it off of Amazon and it is not too expensive. Some specialty baking stores also carry it. If you are in dire straights and must have these waffles sooner than Amazon will deliver them, you can also just break up some sugar cubes. You don't have to have a Belgian waffle iron to make these waffles, but the nice deep ridges sure are a plus in making these waffles amazing. These waffles are definitely best served immediately, preferably with some bacon and eggs. They do not store or reheat well since they tend to lose their crunchy coating and deliciousness. Some authentic waffles will include saffron, but the eggs will give the waffles their nice golden color and the vanilla extract creates an amazing perfume of sweet deliciousness. Whisk the brown sugar and yeast with the water and let stand for about 5 minutes, until it is nice and foamy. Place the flour and salt in a mixing bowl. Gradually add in the yeast mixture until the dough is sort of dampened and shaggy looking. Add the eggs one at a time, beating for 30 seconds after each addition. Whisk the vanilla in the butter and add to the batter gradually. Mix for about 1 minute or until smooth. It will be very sticky and have a thick, but not a stiff texture. Cover and let rise for about one hour. Right before you are ready to cook the waffles, mix in the pearl sugar. If you add it too early it will dissolve and will not create that crispy coating. Using two spoons, pull off about 2 tablespoons worth of batter and place onto a preheated waffle iron. Cook until golden brown. Place on a cookie cooling rack over a sheet pan. Keep warm in a preheated 250 F oven. Drizzle with chocolate sauce if you're feeling saucy and serve warm.